Eclipse renews itself: Galileo has arrived! Finally, another annual release of Eclipse has arrived: version 3.5 aka Galileo. Galileo is the release of Eclipse IDE synchronized with packets tuned for the Galileo release. Eclipse IDE has moved on from being a sole and mere development environment to being a rich architecture. Often, this is not visible to the novice user. Galileo, or the JDT (Java Development Tools) to be more precisely, does not surprise with a load of stunning new features, instead, its a solid continuation of improvements. Concerning the JDT part, it has lost its pace of former days. But Eclipse JDT still is the reliable friend at your side, helping you code. This is a good thing, since Eclipse has been the IDE of choice for many, many Java programmers for a lot of years now and has grown to something like a “standard”. Its usability and reliability are well known and especially the first part has been constantly improved. Galileo now draws its innovative power from the huge amount of different projects which were developed for it. The amount of tools for modeling is impressive. However it is not surprising, since modeling has become a sport in the past month. Consequently, it is bare logic to improve the tooling capabilities and quality. Galileo is following this path, not only because of Eclipse, but with what is available for it. As announced in a previous post the Eclipse Demo Camp Hamburg – Galileo Edition took place in the East Hotel in Hamburg. Organized by Peter and Martin, the event was again an interesting meeting with Eclipse-interested people in a wonderful location. Five presenters introduced Eclipse and OSGi-related topics. Moritz Eysholdt reported about the (Meta)Model Evolutions, he was focusing on during his masters thesis. The interesting part of his solution are two Xtext DSLs for description of the Metamodel changes (EPatch) and model migration algorithms (MetaPatch). Heiko Behrens gave a funny and really good introduction of Xtext and DSLs for not Xtext developers. I really like his examples: these are simple and understanding for everyone. Great job! Marco Mosconi showed some ObjectTeams (black) magic. A very intersting technology using aspect-oriented programming for type-safe framework modifications. Seem to be pretty advanced technology with interesting tooling. 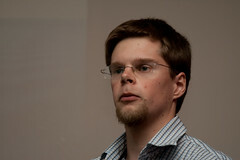 Markus Alexander Kuppe had a talk on ECF and RFC 119 and gave some sneak preview of the upcomming features. Finally, I had a short talk on Common Navigator Framework, basically explaining the article posted here and something I documented for Galileo. Here are some visual impressions: my FlickR set and Peter’s.